Chances are, if you’ve created an ad in the Facebook Ads manager in the last 5 months you’re aware that Facebook is removing the Partner Categories targeting options, i.e. : behavioral and some demographic targeting data. This is sure to impact many advertisers and marketers, but we’re here to say that we’re not concerned about it having a catastrophic impact on your campaign results. There is no need to lose your faith in the platform, or have a panic attack over changes to the ads manager. Cool? Cool. Being successful on social media means being agile. Remaining flexible and adaptable to the constant changes that come with social media marketing is key. The purpose of this blog post is to inform you about the changes to Facebook targeting so that you can continue make the most out of your social campaigns. If you have any questions about how this might impact your ads, just contact us! Our team is always here to help answer your questions. It shouldn’t be news to anyone that Facebook received a ton of heat this year regarding user privacy and how they collect our data. It forced the mega platform to implement quick changes. Thankfully, Facebook will help you recover from the loss of Partner Categories by offering targeting suggestions to replace what is now unavailable. See example below. 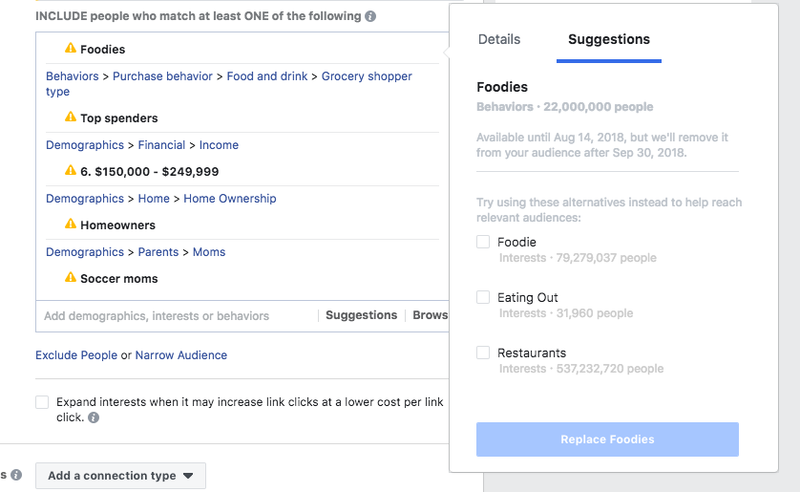 To replace the behavioral target "Foodies," Facebook suggests using interest based options like "Foodie, Eating Out, and Restaurants"
Previous articles had warned that by October 1st Partner Categories would be unavailable, but everything we’re seeing points to August 14th being the cut off date. These targeting options might appear visible, but they will not work in your ad campaigns. Like we said before, this is not a cause for panic. We have full confidence in Facebook to continue to give us the tools to create and manage successful social media campaigns. However, these changes will require marketers, entrepreneurs and small businesses to think critically. -Don’t rely on one marketing channel (i.e: putting your eggs in one basket). Instead, experiment with Google Adwords, Google Display, Youtube Ads, Linkedin Ads, etc. We manage social media campaigns for clients across several industries, and each of them will be impacted by these changes one way or another. Although we’re bummed to lose some of these targeting options, we’re not freaking out about the changes and you shouldn’t either. As digital marketers, we’re used to constant change - it’s the way our industry works! But it’s important to stay on top of these changes and know how to correctly pivot. We hope this helps shed some light on the recent targeting options removed by Facebook and puts any of your potential fears at bay. If you have questions about your ad campaigns and how they might be affected by these changes, don’t hesitate to reach out to us! We’re always here to be a resource.